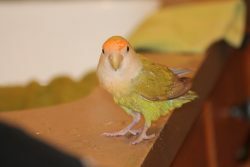 I have been a lovebird owner twice. Ruby lived with me for 19 years, followed by Mixie for eleven. Both were hand-fed from birth, which means they bonded with humans instead of other birds. 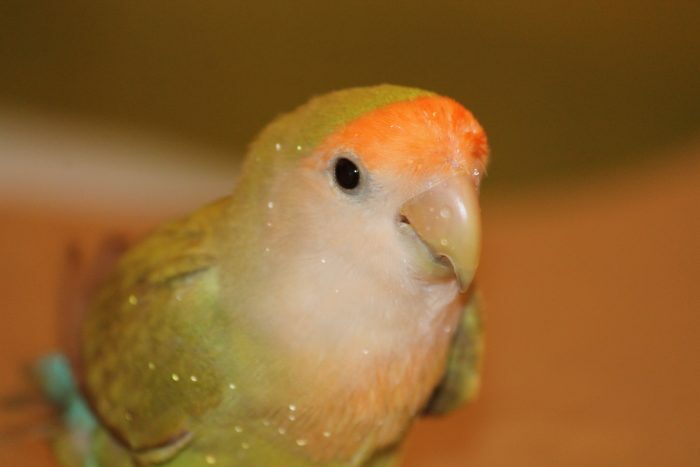 Many bird owners clip their bird’s wings so they can’t fly away and will stay perched on a finger (because they can’t fly, not because they are necessarily enjoying themselves.) 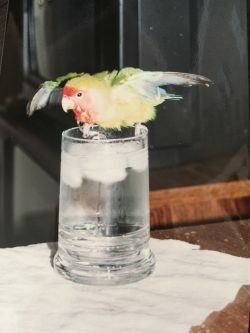 When I made the decision NOT to clip the wings of my birds, I was told by vets and bird breeders alike that my birds would fly away and it would be my fault. No mishaps occurred with my birds, however. Both brought me only joy. I could hold each of them in my hands, snuggle them next to my face, and watch each of them enjoy taking water baths. Ruby would take baths in glasses of ice water on the counter. Mixie preferred taking baths by standing on the divider in my double kitchen sink under water coming directly from the faucet. Perhaps it was my experience with lovebirds that caused me to pause recently on Psalm 91:4: He will cover you with his pinions, and under his wings you will find refuge; his faithfulness is a shield and buckler. Hmmm, what is a pinion? As a NOUN, a pinion is 1. The wing of a bird. 2. The outer rear edge of the wing of a bird, containing the primary feathers. 3. A primary feather of a bird. As a VERB, a pinion is 1.a. To remove or bind the wing feathers of (a bird) to prevent flight. b. To cut or bind (the wings of a bird). Wing clipping is the process of trimming a bird’s primary flight feathers (“primaries”) so that it is no longer fully flighted. Can you see how the large flight feathers extend from the outermost pinion? When I was encouraged to clip the wings of my birds so they could not fly, it meant clipping the last pinion from which those flight feathers extend. Doing so renders birds either flightless (hopping around on the floor) or flight impaired (being able to fly short distances from the floor to the couch back, for example). God’s pinions are not cut! We get His entire wing, including the flight feathers. This truth makes me think of Isaiah 40:31: but they who wait for the LORD shall renew their strength; they shall mount up with wings like eagles; they shall run and not be weary; they shall walk and not faint. So whether we need protection UNDER God’s wing, or the ability to soar LIKE God’s wings, we have ALL of God’s wings every moment of every day. I am encouraged by that this summer. Can’t get it off my mind. I hope you are encouraged too.